‘Dolfo’ Galland started flying gliders at the age of fifteen, rising to command the ‘Ricthofen’ Fighter Wing in the Spanish Civil War. He fought in the Battles of Poland, France, and Britain, leading the famous JG26 ‘Abbeville Boys’ in the West. Promoted to Inspector General of Fighters in November 1941, he had total responsibility for all day and night fighters throughout the Luftwaffe. ‘Dolfo’ was the youngest General in the German High Command, but his disagreements with Goering’s tactics led to his dismissal. Reverting to combat, flying the Me262 leading the JV44 jet wing, he became the only General in history to lead a squadron into battle. 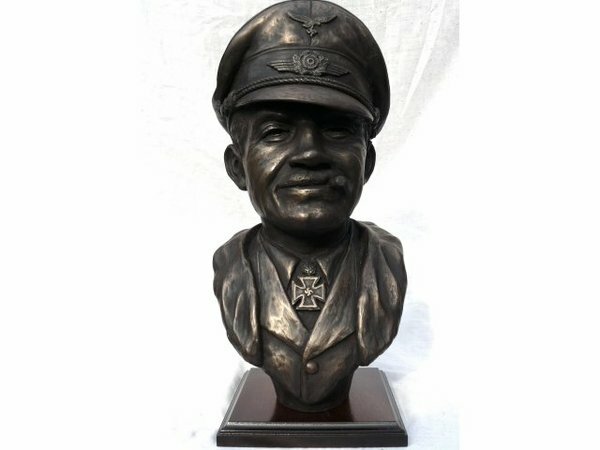 This outstanding hand made, cast bronze sculpture is issued in a highly restricted edition, authenticated by individual Certificates of Authenticity containing a full biography. Following completion of the last sculpture in the edition, the original mould is destroyed to protect the integrity of the edition.